Hi everyone - wow do these Thursdays come around quickly. But of course Thursday is a new challenge day over at MAWTT and this week the lovely Hazel has set the theme - All That Glitters. No sketch to follow this week but with such a fab focus for creating glittery and shiny cards - who needs one? 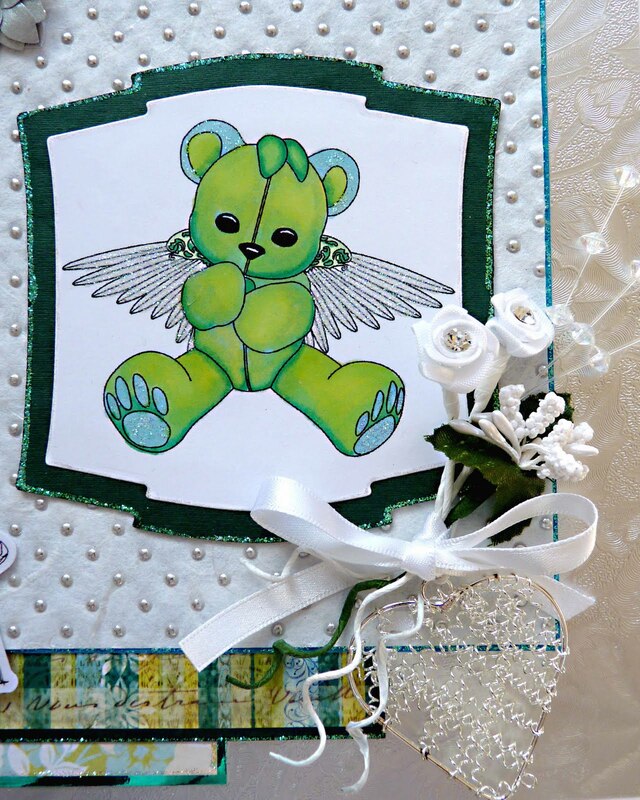 The sponsor this week is my friend Stitchy from Stitchy Bear Stamps and I have used a digi that I won on a One Stitch at a Time challenge blog, before I became a DT member for them. 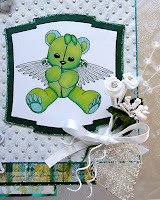 It is called Miss Wings and I just love this cute bear with it's little wings, even my husband commented on what a great image it is (and he's never done that before!!!! ), so it was great fun to colour her up and use it on this card. Do go take a peep at what she has in her store. 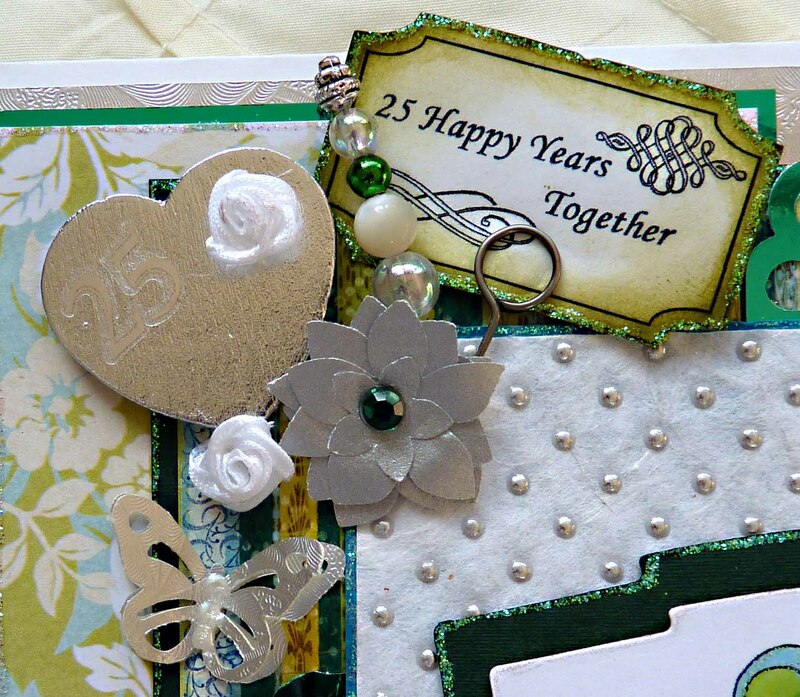 I made the card for some friends who have recently celebrated their 25th Wedding Anniversary and sadly we couldn't go to their celebration as we were on holiday, but we hope Donna and Jimmy had a wonderful party and wish them every happiness in their next 25 and more years together. As you can see I have gone quite shiny and glittery with this card but I am so pleased with the effects. I started by choosing my DPs which set the colours for me and in many ways it is quite monotone. 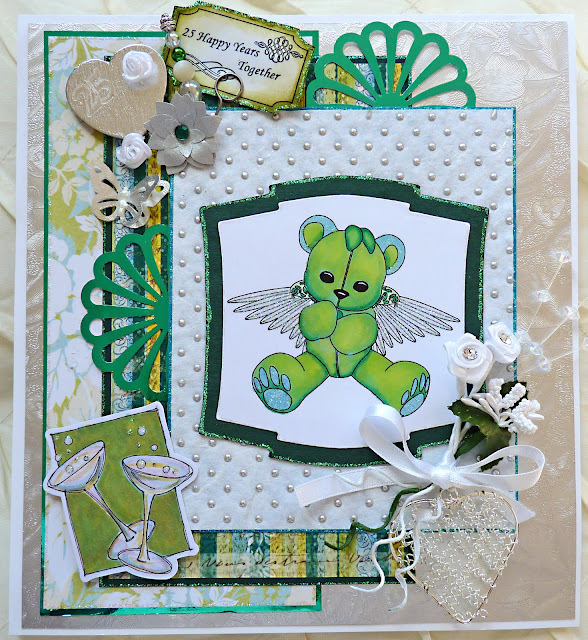 I have used a MS punch, Nestabilities labels 2, embellishments from my stash. The ticket is one from Lindsay's stamp stuff and I actually changed the words using Photoshop Elements so that it fitted for my card. I decorated the inside but kept it very simple to contrast with the outside. All the DPs and the ticket are edged with stickles and the wings, feet and ears on the image have been glittered. I also used stickles on the bubbles of the champagne. Lovely card, love the image, the colours, the glasses - oh, just the whole darn lot!! Hi Brenda, hope you are having a lovely break? Seems really quiet without you at MAWTT central, lol! 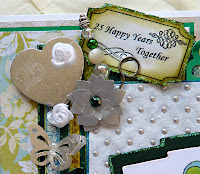 Love your card, great colours image and embellies, lots of them! Gosh Brenda this is wonderful the colours, embellishments and image are truly beautiful. Pop over to my blog - I have something for you!